If cat-shaped lipsticks aren’t really your thing, Paul & Joe have also released three new (and rather lovely) limited edition face colour shades for Autumn/Winter and as always… P&J know exactly how to do the pretty. Blended with several varieties of champagne gold frost, each face colour has an individual overtone and translucent sparkle creating a truly sublime radiant glow. How perfect does the champagne frost sound for the upcoming party season? 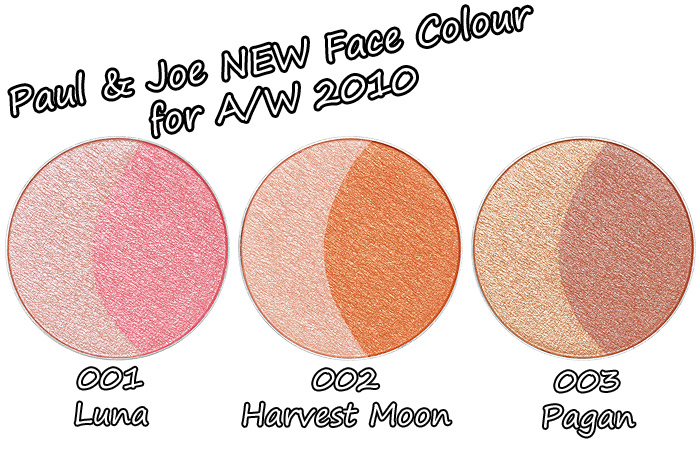 Paul & Joe Face Colours are priced at £15 each and available instore from Fenwicks and Harrods. Alternatively you can buy online from Zuneta and HQHair. pagan looks really lovely but I’m not sure how I feel about the name..